Filters can be used to alter the output during printing. You can add filters to your theme’s functions.php or a custom plugin. More information about filters for WordPress. 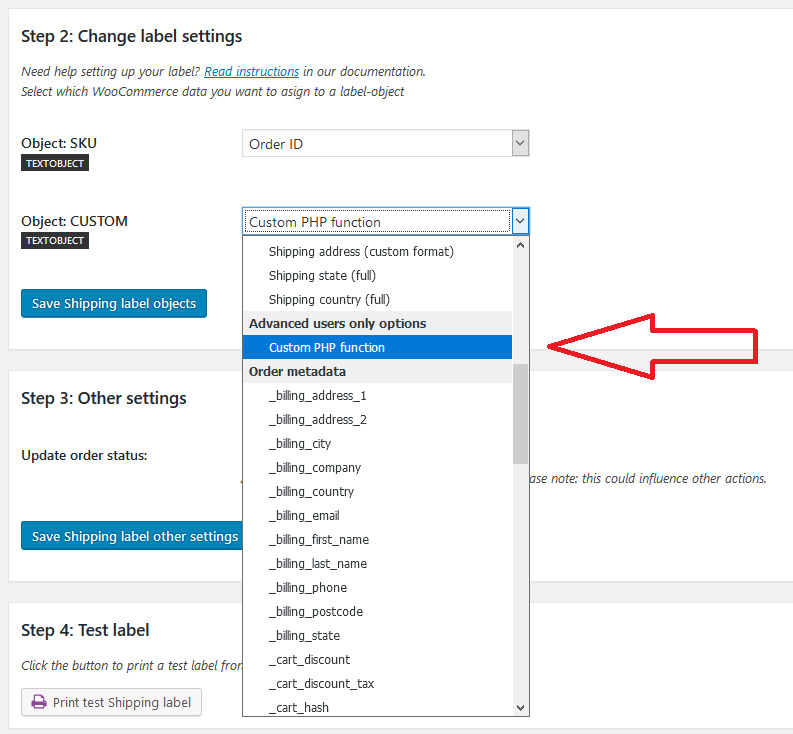 With the filters on this page you can modify the behavior of WooCommerce DYMO Print in several ways. Filters are for advanced users only. Do not ask us to write or adjust these codes for you. If you do not know how filters work, do not use them! Back-up first! If you do something wrong, adding code to your functions.php can break your site! This filter can only be used for order and order item labels. This filter does not work for product labels. By default 1 label is printed per order. However you can change how many labels to be printed per order. 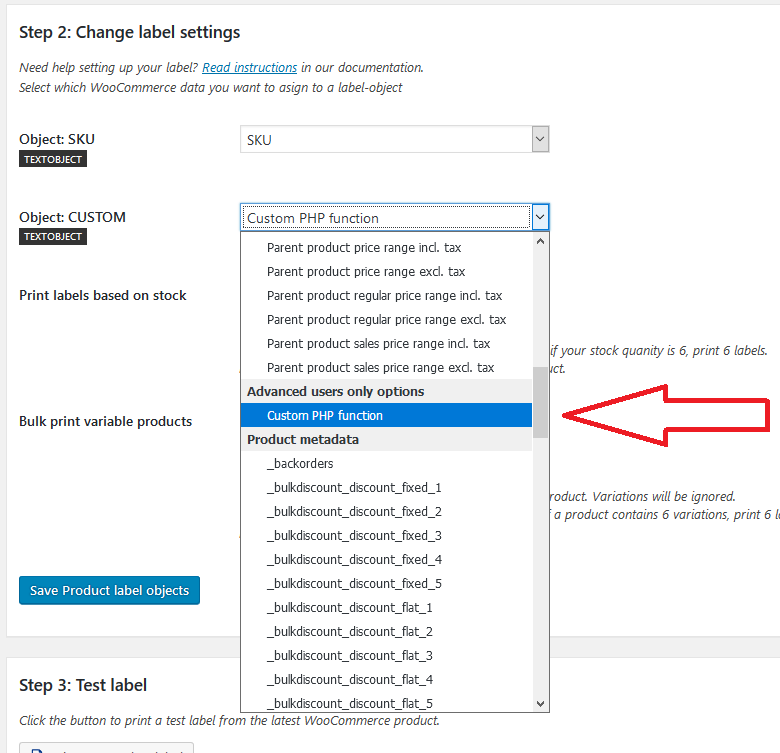 To print 2 labels for every order place the following code in your theme’s functions.php or in a custom plugin. Do not alter the filter name “wpf_woocommerce_dymo_labels“, otherwise the filter becomes quite useless. $amount = the current amount, by default 1. The amount needs to be returned to the plugin. Needs to be an integer. $order = the order object of the current order. $label = the current label, for example ‘shipping’. This is the key of the label and is always unique. The following example shows advanced use of the filter. We first check if the default Shipping label is printed. After that we get the total weight of all products inside the order. If the total product weight is 10kg or more, we print an extra label. If not, we print 1 label. return $amount; // Return the amount to the plugin. Must be integer. As from WooCommerce DYMO Print version 3.1.1. it’s possible to overwrite the output of order-item attribute data. By default the order-item attribute data looks like: label: value. Some people wanted to overwrite the output, so they can add another label or a suffix to the value. To overwrite order item attribute data you need to choose the option “Order item attributes (requires WC 3.1)” option from the configuration dropdown. You also need to use a filter to overwrite the output. Add the following filter to your theme functions.php or a custom plugin. If your products have multiple attributes the varible $key could be used to identify the $key and return a specific output for it. With WooCommerce DYMO Print version 3.1.4. we’ve added the possibility to adjust the output of the ORDER ID. You can use this for example to add the ORDER ID to a custom string or an URL to the order edit page (admin). With WooCommerce DYMO Print Product add-on version 3.1.1. we’ve added the possibility to adjust the output of the PRODUCT ID. You can use this for example to add the PRODUCT ID to a custom string or an URL to the product edit page (admin). * - $label: The name of the label, for example: "billing" or "shipping"
* - $object: The name of je label-object. for example: "ADDRESS_1"
Only return data if label name is "shipping" for DYMO Label object-name is "ADDRESS_1"
//Return a list (string) of all product inside this order, make sure it's well formatted before printing. * - $label: The name of the label, for example: "product"
* - $object: The name of je label-object. for example: "TEXT_1"
Only return data if label name is "product" for DYMO Label object-name is "TEXT_1"
With the following filter you can alter all label data for WooCommerce order or order-items. You need to return all data as an array. Each element inside the array will print a new label. So if you want to print 4 labels, the filter must return an array containing 4 elements. All labels are printed in the same design. If you want to print multiple labels on different label sizes and in with different designs use label combinations. The following example gets the order, checks which items are in cart and prints product information for each item in the order on a separate label. With the following filter you can alter all label data for WooCommerce products. You need to return all data as an array. Each element inside the array will print a new label. The following example gets the product, checks if the weight of the product is above 1kg and prints an extra label which contains weight. If you’re looking for sample labels, you’re on the wrong page. Click here to download our sample labels. The filters on this page are for advanced users only. We can not write custom code for you for free. However if you’ve a specific wish for code or functions we can do custom development for you. Contact us for a quote.